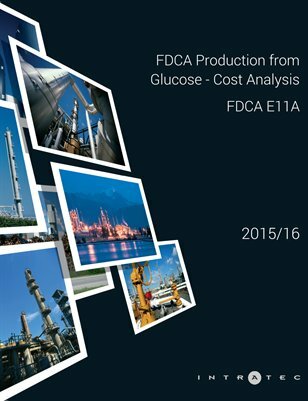 This report presents a cost analysis of 2,5-Furandicarboxylic Acid (FDCA) production from glucose syrup via the furan pathway. The process examined is similar to the Avantium YXY process, which is being scaled up to become a commercial process. In this process, glucose is isomerized to fructose. Then, fructose is converted to methoxy methyl furan (MMF) intermediate, which is oxidized to FDCA. The process uses a 70 wt% glucose-water syrup as raw material and generates methyl acetate and methyl levulinate as by-products. This study provides readers with key and hard-to-find information regarding a production process technology and its economics, such as a description of the manufacturing process and industrial site installations, plant construction cost breakdown, production cost breakdown, and raw materials consumption figures.